This control is compatible with the 1996 (ED) and newer Modular Wiring System. This control supports the SystemCheck™ engine monitoring system and allows single-lever control of an Evinrude® or Johnson® outboard motor. 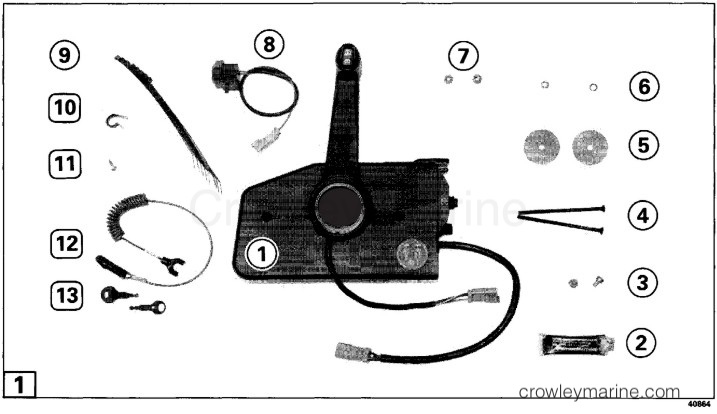 Installation of this kit involves procedures for connecting throttle and shift cables to motor, described in detail in Service Manual for your product. If you do not have the required literature and do not wish to purchase it, have this kit installed by your Evinrude/Johnson Dealer. To Installer and Owner - INSTALLER: Give these instructions to owner. OWNER: Read sections Remote Control Operation, and also Operator Tests and Adjustments, located at end of the document, before you operate your boat. Keep these instructions with your Operator's Manual. If a non-BRP instrument cable is used, it must have equivalent wire type and size, and meet A.B.Y.C. standards (or standards that apply in your country). Key Switch Operation - Push emergency stop switch clip (A) onto key switch. Attach lanyard (B) securely to clothing. If operator is thrown from helm, lanyard will pull clip off switch and stop motor. In an emergency, a passenger can put remove control in NEUTRAL and restart motor without lanyard. Do not operate motor with clip removed from switch. except in an emergency. If you do, and if primer is used while motor is running, the starter and flywheel can be damaged by accidental starter engagement. To open throttle without shifting into gear (for easier starting if motor does not have QuikStart™ electronic starting): With remote control handle in NEUTRAL (C), lift warm-up lever (D) to open throttle for starting and warm-up. The control is locked in NEUTRAL when warm-up lever is raised to prevent shifting into gear at higher than idle RPM. The control handle is unlocked when warm-up lever is all the way down. Turn key from OFF (E) to ON position (F). The warning horn should sound momentarily to indicate it is working. turn key to START position (G). To prime, push and hold key IN and turn to START. Release key as soon as motor starts. Key may be pushed IN momentarily (in ON position) for additional enrichment to keep motor running. DO NOT turn key to START while motor is running. NOTE: Push warm-up lever part way down as soon as motor starts. Do not run a cold motor any faster than necessary to keep motor from stalling. Do not exceed 2500 RPM in NEUTRAL. Motors with QuikStart, wait until motor slows to normal idle RPM before shifting into gear. See complete starting instructions in your operator's manual. To shift into gear: With the control handle in NEUTRAL (C) and warm-up lever DOWN, lift the neutral lock lever (H) and move control handle to FORWARD gear or REVERSE gear position (I) or (J). Release neutral lock lever and move control handle more to open throttle. Trim/Tilt Switch - Push top of switch (M) to trim out and tilt up or push bottom of switch to tilt down and trim in. This control can be mounted in a "STARBOARD POSITION" on the starboard side of the boat (A), or port side of the center console (B) without modification. In the "STARBOARD POSITION," the starboard side of the control is next to the boat surface. The control may be mounted in a "PORT POSITION" on the port side of the boat (C), or starboard side of the console (D) if the control handle is relocated to the opposite side. Place remote control at proposed location and check clearance around control handle at full throttle in FORWARD and then at full throttle in REVERSE. There must be at least 4 in. (100 mm) of clearance (E) between the handle and any part of the boat throughout the control handle travel. There must be at least 12 in. (305 mm) of clear space (F) behind the control for the control cables (6 in. (152 mm) to the beginning of the first bend). When selecting the mounting position, consider that the handle may be repositioned FORWARD from the normal position in 20° increments (G) on the control shaft spline. The control body can also be repositioned in 20° increments (H) from the normal position to change the position of the control and the direction the control cables protrude from the control. This is done by repositioning the handle and mounting the control at an angle. The control body MUST NOT be mounted where the key switch is not readily accessible. Hold remove control in selected position and mark two mounting hole locations (I) on mounting surface. Drill two 5/16 in. (8 mm) holes. From center of handle at mounting position, such as (A) or (B), measure along intended cable route to motor centerline at transom height (C), as illustrated by either dotted line. Add 3 ft. 4 in. (1,02 m) to the measurement. This dimension is the required cable length. Snap-In® control cables are available in one foot increments from five foot to twenty foot length, and in two foot increments to fifty foot length. Pick cables that are equal to your calculated length, or are the next longer available length. 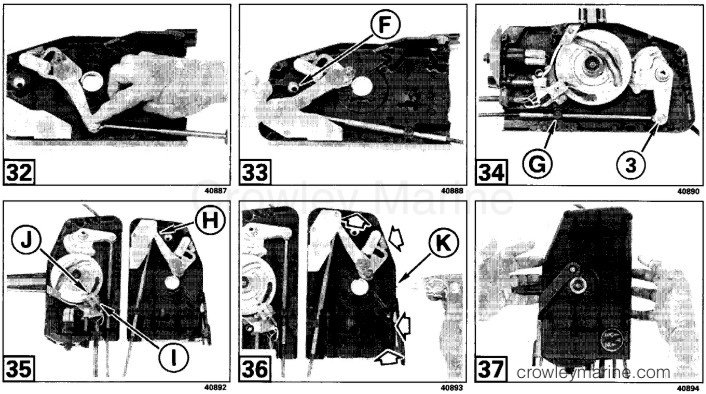 In this instruction, the port side of the control (G) is called the "COVER," and the starboard side (H) is called the "HOUSING." With control handle in NEUTRAL, loosen allen head screw holding handle to remote control hub three turns. Place a small punch in head of screw and tap punch with hammer to disengage handle from hub splines. Remove screw and handle. Remove three screws holding neutral lock plate to remote control cover. Reinstall neutral lock plate on housing. The neutral lock plate must be installed so the notch (A) aligns with control handle when the control is in NEUTRAL. The neutral lock palte must be in place and properly positioned. Tighten screws to 25-35 in. lbs. (2,8-4,0 Nm). Pull neutral lock lever up and temporarily position handle splines into hub splines on starboard side of control with the handle in NEUTRAL. Be sure neutral lock slide engages neutral lock plate notch. Do not tighten allen had handle screw until cables are installed. The remote control is factory assembled with control handle perpendicular to control when control is in NEUTRAL (Handle is VERTICAL when control is HORIZONTAL). If you want control handle in a different position relative to the control housing, you will need to reposition handle on control shaft splines. With control in NEUTRAL, loosen allen head screw (B) holding handle to remote control three turns. Place small punch in head of screw and tap with hammer to disengage handle splines. Remove screw and handle. Pull neutral lock lever up and hold up during this step. Temporarily position handle splines in hub splines in new NEUTRAL position. Check hand clearances at wide-open throttle (W.O.T.) in FORWARD and REVERSE, and check cable clearances. Note that neutral lock will not operate correctly - must hold neutral lock lever UP so handle may be moved to W.O.T. in FORWARD and REVERSE. Verify that control is in NEUTRAL and handle is in new NEUTRAL position on splines. Place tape under the handle, and mark the tape on each side of handle. With control still in NEUTRAL, remove handle. Remove three screws that hold neutral lock plate. Reinstall neutral lock plate in new position. The neutral lock plate notch (A) must be centered between two marks on the tape. Install and tighten screws to 25-35 in. lbs. (2,8-4,0 Nm). If control is to be mounted in a "STARBOARD POSITION," install handle now in-line with neutral lock plate notch. Check that neutral lock slide drops into notch, that control is in NEUTRAL when slide is in notch, and that handle does not lock in any position other than NEUTRAL. Insert handle screw and tighten to 50-60 in. lbs. (5,5-7,0 Nm). Place control lever in NEUTRAL (A), and remove three assembly screws. Lift housing half off of cover half. Lubricate control cables with Triple-Guard Grease (2). Place housing half on a bench. With fast idle lever (B) completely down, move throttle lever (C) out from behind plastic separator plate (D). Do not remove plastic separator plate. If plate is missing, cable pins can fall out and control will jam. Grease trunnion pocket (E) and cable pin (3) with Triple-Guard grease. Place throttle cable eyelet between throttle lever halves, and drop pin through throttle lever and throttle cable. Insert cable trunnion into pocket, and push throttle lever forward against stop (F). Grease trunnion pocket (G) in cover half and cable pin (3). Place shift cable eyelet between shift lever halves and drop pin through shift lever and shift cable. Press cable trunnion in trunnion pocket. Shift lever must be in NEUTRAL before control is reassembled. Throttle lever (H) must be forward against stop. Neutral start switch (I) must be in the center of neutral start cam (J). In slat water environments, seal front, back, and top joints (K) of two halves with black silicone sealer before securing halves together. With cover half lying flat on bench and warm-up lever down, place housing half on top of cover half. Do not turn cover half over. Shift cable pin could fall out and jam control. Apply Triple-Guard grease (2) to assembly screws (A), and tighten screws to 40-50 in.lbs. (4,6-5,5 Nm). For controls mounted in a "PORT POSITION," align control handle with neutral lock notch and install control handle. Tighten allen head screw to 50-60 in. lbs. (5,5-7,0 Nm). Install remove control with mounting screws (4), flat washers (5), lock washers (6), and nuts (7). Be sure mounting screws are tight enough so control does not move during operation. NOTE: Use a manual screwdriver; a power screwdriver could damage cover. Connectors: Check mating surfaces of connectors for dirt or other contaminates. Remove all dirt, old lubricant, etc. Immediately before joining, apply a light coat of Electrical Grease to seal (B), and also on seal (C) if control has trim and tilt. Align six-socket plug (D) on instrument cable with control receptacle (E). Push connector together until latched. Align three-socket plug (F) on instrument cable with control receptacle (G). Push connector together until latched. Install on an instrument gauge mounting stud (H). Retain to instrument wiring using tie strap (9). Locate the tan/blue stripe and purple wires and the 2-socket plug (I) on the instrument cable. Check mating surfaces of connectors. Remove all dirt, old lubricant, etc. Immediately before joining, apply a light coat of Electrical Grease to seal (J) on plug. Align and push horn receptacle and instrument cable plug together until latched. 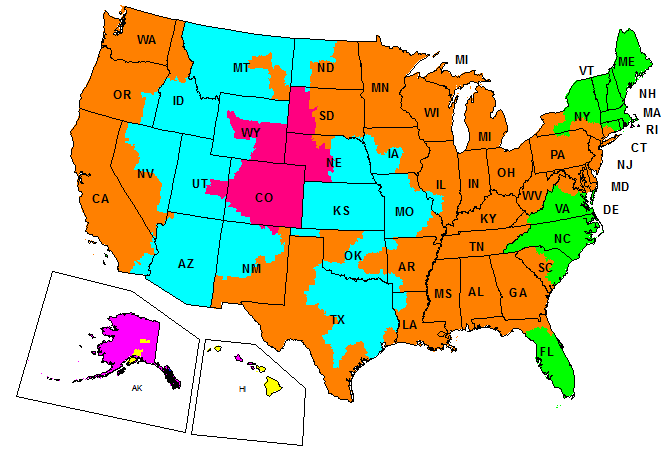 NOTE: Do not allow cable to pull on warning horn wires. You must provide a 12 in. (30 cm) minimum diameter loop (K) in cables between last boat fastener and motor anchoring point. Route control cables in a straight line, without sags, and secure to boat every 24 in. (61 cm) with tie straps (9) or clamps (10) (one supplied). Place first fastener 24 in. (61 cm) behind remote control. If you use cable clamps (10) and screws (11), do not squeeze cable out-of-round. Before connecting cables to motor, check that control operates freely, and equal friction is felt in FORWARD and REVERSE throttle range of control handle. Any binding could cause control to jam when cables are attached to motor. Refer to motor service manual for control cable connection procedure. Plase control in NEUTRAL. The neutral lock slide must be engaged in the neutral lock plate notch. Rotate propeller. If propeller does not rotate freely, review cable connection procedures in service manual. Check to be sure cables are attached on correct lever: With control handle in NEUTRAL, lift warm-up lever. Only the throttle cable should move. Separate connector between charge coil and ignition module, or disconnect all spark plug wires to keep motor from starting. Removing clip from key switch WILL NOT prevent motor from starting. This remote control is designed to crank motor in NEUTRAL only. If control handle in "in-gear," starter will not operate. The lanyard clip (12) may be attached to key switch or may be removed for the following test. Use this test to make certain starter motor will NOT operate when control handle is in FORWARD or REVERSE and WILL operate when handle is in NEUTRAL. -urn key (13) to START position. The starter should operate. With key still in START position and starter cranking motor, lift neutral lock lever and move control handle to FORWARD. The starter should stop as control leaves NEUTRAL. With key still in START position and starter cranking motor, lift neutral lock lever and move control handle to REVERSE. The starter should stop as control leaves NEUTRAL. Press top of switch to trim motor out and tilt motor up. Press bottom of switch to tilt motor down and trim motor in. If pressing switch does not operate trim/tilt motor, check switch-to-motor connection. Operate trim with lower motor cover switch (if on your motor). If trim does not work, have trim unit checked. If trim works with lower motor cover switch but not with remote control switch, have your dealer inspect remote control. When testing boat in water, tie it securely to dock to prevent motion. Attach lanyard clip to key switch. Place control handle in NEUTRAL position. If motor does not have QuikStart, lift warm-up lever to pen throttle for easier starting. Turn key ON. The horn should sound momentarily to indicate it is working. Turn key to START position. If priming is required, push and hold key IN and turn to START. Release key as soon as motor starts. Key may be pushed IN momentarily (in ON position) for additional enrichment to keep motor running. DO NOT turn key to START while motor is running. NOTE: Push warm-up lever part way down as soon as motor starts. Do not run cold motor any faster than necessary to keep it from stalling. Do not exceed 2500 RPM in NEUTRAL during warm-up. See complete starting instructions in operator's manual. After motor has warmed up enough to idle smoothly, push warm-up lever down. Warm-up lever must be all the way down before shift lever can be moved out of NEUTRAL. For motors with QuikStart, wait until motor speed drops to a normal idle RPM before shifting into gear. Check that motor shifts to FORWARD when control is shifted to FORWARD, and shifts to REVERSE when control is shifted to REVERSE. Check that remote control operates freely and equal friction is felt in FORWARD and REVERSE throttle range of control handle. Any binding could cause remove control to jam during operation. Test Operation of Emergency Stop Switch - Test stop switch every 30 days. Start motor and check operation of stop switch by pulling lanyard (A) to remove clip from key switch. If motor does not stop, return control to dealer for repair. Adjust throttle friction - Turn adjustment knob (B) clockwise to increase friction.